Watermarks have been used on currency, postage stamps and other government documents for centuries. Their main purpose is to prevent counterfeiting. It is an identifying image or pattern. The image or pattern can be seen in different shades of light or dark when light passes through it. In some cases, the pattern is seen only when the background is opaque. Originally, watermarks were created by changing the thickness of paper. With the era of technology and digitization, most images and professional work is available in digital form. In order to protect these from copy or counterfeit, several applications which can be used to place watermarks have been developed. Certain applications have in-built watermarks. When the user prints documents from the free or trial version, the watermark for that particular application appears on the document. This ensures that the application is used appropriately, or purchased as and when required. The bits which are inserted into an image, video, audio, etc from the digital watermark. These give information about the author, copyrights, permissions and other relevant information. Some digital watermarks are designed to be completely invisible. The bits forming the watermark are scattered through the file. This ensures that they cannot be easily identified or removed. Thus, it cannot be used by unauthorized users. In this way, the watermarks can be used to protect professionally or personally created images. Watermarks are a form of data embedding and information hiding. Hence, watermarks can be used to make sure that data is not misused. Also, it ensures that the watermark is visible only by using right applications. Due to their flexibility, watermarks are used for other purposes. Besides being used to protect photos from being published without the owner’s consent, these are used to add captions to photographs. This helps keep up records, and add a description of the image itself. It can also be used to tag people, or give further information about the picture. Making memes, superimposing images, and to generally showcase creativity, watermarks can be used. Free advertisements are also created. As a professional, it becomes important to make sure that your images or documents are not used by someone else. One of the most common methods used to protect a person’s rights over data is by creating a watermark. For the Mac, several apps are available which can be used to watermark images. 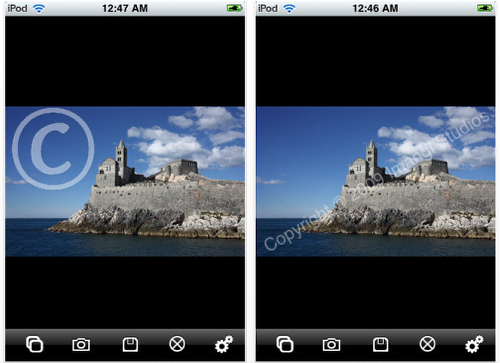 iWatermark Pro: Available for Android, Windows, iOS and Mac, is one of the best watermark apps available. It provides a combination of high flexibility and easy usage. Smooth and effective, it provides 6 types of watermarks, viz; text, graphic, QR, signature, metadata, and steganographic watermarks. It allows the user to work with photo batches, and allows a variety of languages and effects. Compatible with nearly all cameras, this also allows the user to share their work on social media. This application is compatible with most photo-editing applications like Lightroom, Photoshop etc. uMark: Available for both Windows and Mac, this free application provides all the required functions of a watermark app. Text, images, shapes, QR codes, frames, borders etc, can also be added. Watermarks can be placed anywhere, and previews of these watermarks are also available. Apart from watermarking images, this application can also be used to watermark PDFs. Thus, it is a flexible and effective app. Watermark Pro: One of the most popular apps for this task, it allows you to add text, logo and QR watermarks. Line art, smart text, a map or an export module may also be added. Adding, resizing and shifting the watermark is simple. For most everyday purposes, the app is free. JetPhoto Studio: It supports image watermarking, but does not allow use of text in the watermarks. Batch editing is possible. This is an offline application which works with both Windows and Mac. Visual Watermark: With 12 in-built watermark templates, this app is extremely useful for creating batch watermarks. Watermark effects can also be added to the image and/or text watermarks. These apps can be used to protect your image credits. They all do the task well, and vary only in terms of features and pricing. These are some of the best ways to create watermarks on your Mac. By protecting images and other creations, the user can make sure that his or her work is not used without their consent. Any image can usually be downloaded from the internet. It is impossible to prevent this. However, by using a watermark, this practice of downloading without permission is discouraged. It also provides free advertisement for the creators. Additionally, content creators can share their copyright details. Creativity is enhanced. This is particularly important for professionals who need to layer data and prevent it from being copied. These applications simplify the process of adding watermarks.